Radisson Blu Cebu is hands down of the best hotels in the Philippines. We might go as far as saying it’s one of the better 5 star hotels we’ve ever been to, with an experience of more than 8 years in the travel business already. International standards coupled with Filipino hospitality at its best, and for extremely affordable rates when it comes to 5 star accommodation. What more can you possibly ask for? 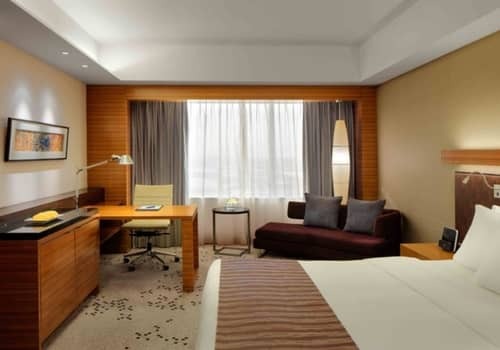 Radisson is a well known chain of hotels specializing in urban luxury accommodation. 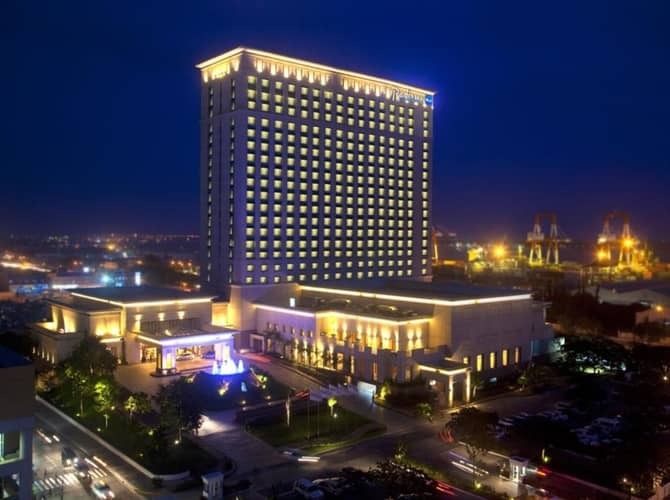 A subsidiary of the Carlson Rezidor hotel group, it operates 990 hotels in 73 different countries. Here, they bring their high level of expertise and adapt their offers to meet the requirements of tourists visiting the Philippines. The staff is all local, but management isn’t, which ensures the highest levels of professionalism and excellence are maintained. 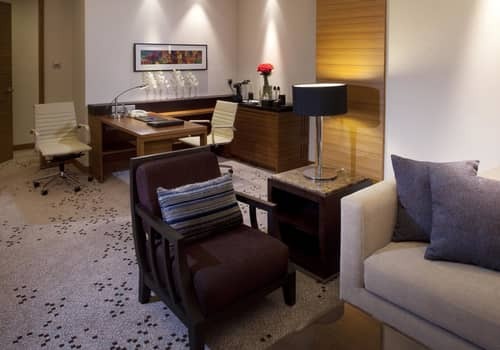 Those who want an all inclusive luxury experience in the city, should look no further than the Radisson Blu. 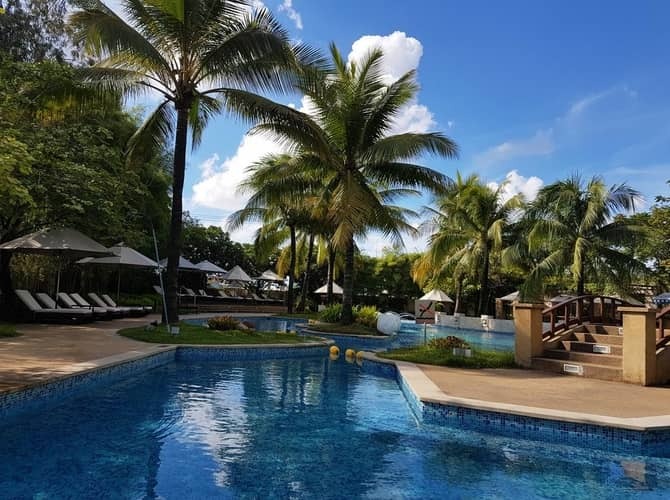 While families might do better to choose one of the fantastic resorts in Mactan, such as Movenpick or Shangri-La, this hotel is a perfect choice for couples and young people who want to enjoy the endless possibilities Cebu city offers. Even though this is a very large hotel, you can expect outstanding service. Waiting times are short, and the staff is always friendly and helpful. The public areas are designed to inspire awe and majesty, and are all very spacious and clean. The rooms are all modern and we couldn't find even the smallest fault in any of them. Fully stocked with all amenities you can think of. If something runs out, just call room service and you'll have it replaced immediately. 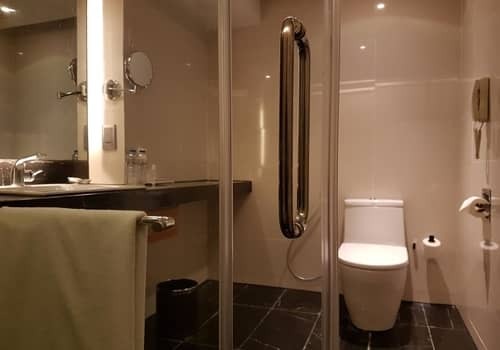 The shower area is large and comfortable, and so is the bed. there's a large swimming pool at the ground level with a bar right next to it. It spans over 800 sqm and is divided into a few different sections. Since this is a city hotel, naturally there's no beach anywhere near. Just across the street from the huge SM mall, where many restaurants, coffee shops and stores can be found. Catching a taxi is always easy, no matter the time. The Radisson isn't at the center of the city, but it's only a 10 minutes drive at night to reach the various popular nightlife venues. There's a reason why this hotel is considered the best in Cebu - the chances you'll end your stay there feeling disappointed is close to 0. 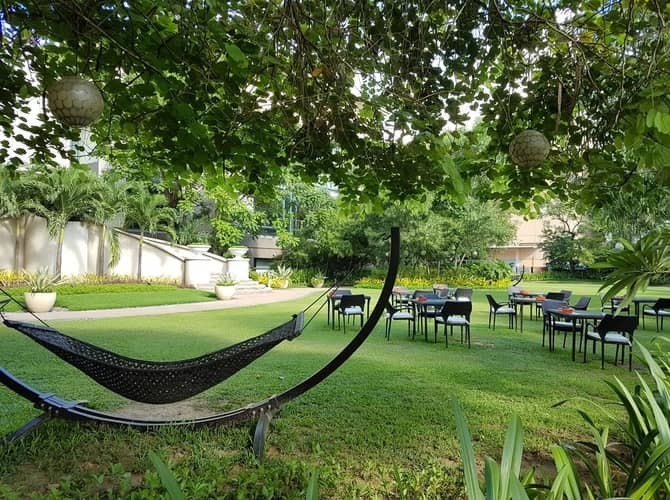 While some other 5 star hotels in the city itself are slightly cheaper - here you are guaranteed a world class experience and the price is still very fair. 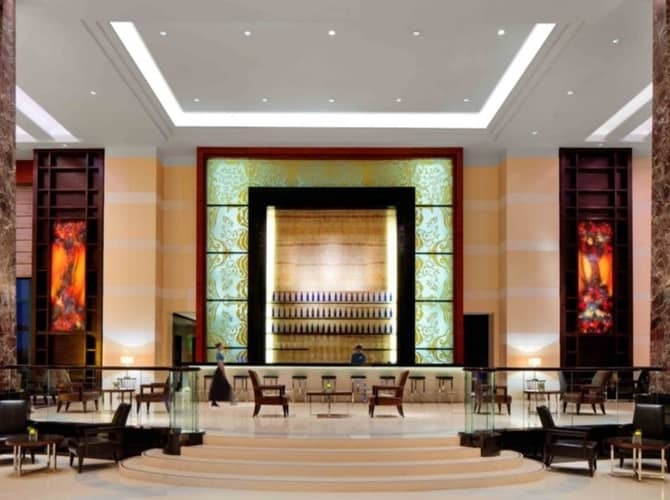 When we first entered the Radisson Blu, our jaws literally dropped by how big the lobby is. With so much people there, you expect a lot of noise and commotion, but surprisingly everyone are calm and collected. You immediately get the sense this is a well oiled machine, and know that this is going to be a wonderful experience. 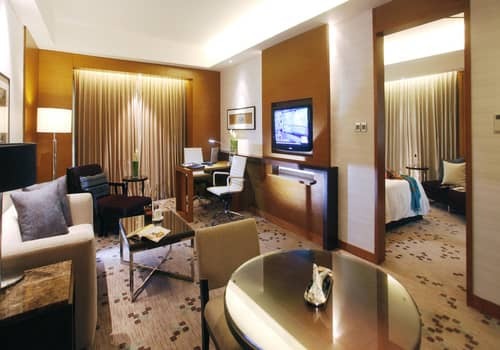 Rooms at the Radisson Blu are divided into three categories : regular, business and suites. 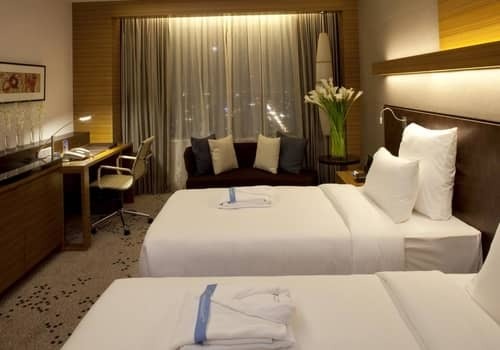 The regular category features the superior room, which is the cheapest option available, and the the deluxe room which is a great choice for larger groups. 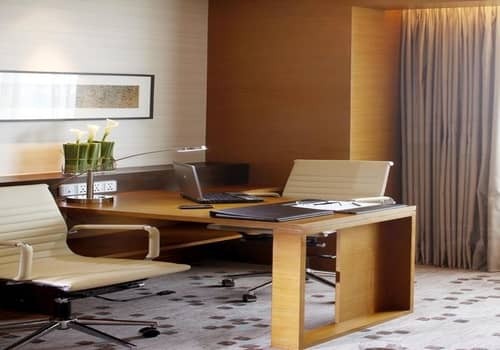 For business, you get to choose between a simple business class room and the premier room. 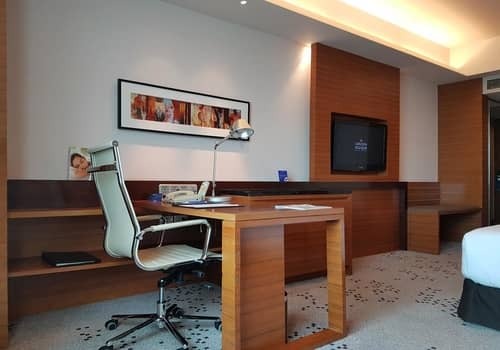 While the rooms in both categories are almost equal in size, we found the business rooms provide the best value for money. That is because you’ll get access to the business lounge located at the 21st floor. Over there, you can enjoy complimentary snacks and refreshments all day long, as well as a very nice lunch and dinner buffet. It’s also a great place to sit and do some work, and you can even reserve their meeting room for 2 hours. All rooms, even the most basic, have a TV with over 80 different channels from all over the world. 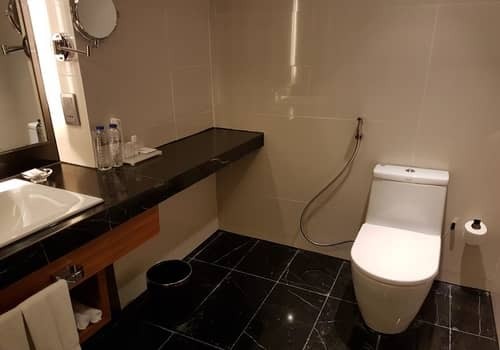 There’s also a great WiFi connection, much better than at most other hotels in the Philippines. The beds are clean and comfortable, and the shower has really hot water and a strong flow at all times. Smoking rooms are also available, but you’ll have to let us know in advance since these are in very high demand. 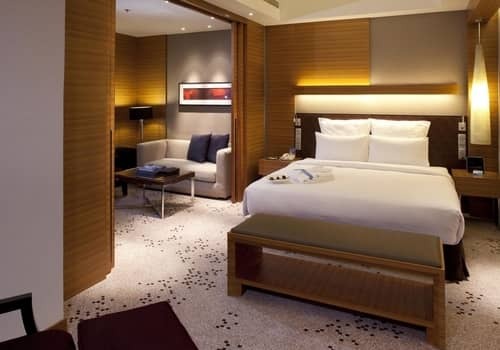 Do Guests like The Radisson Blu? The Radisson Blu Cebu enjoys an extremly favorable reputation everywhere you look, and is one the most popular choices for people visiting Cebu. To us, that hardly comes as surprise since we always stay there ourselves whenever we are in the city for business. Also we never had any of our client complain about his stay at the hotel. Still, we always keep an open eye and go over every comment posted online. We want to be able to keep this review as fresh and accurate as possible, and provide you with the best idea of what this hotel is about. We hope this will help you make an informed decision and reduce the chance of disappointment. 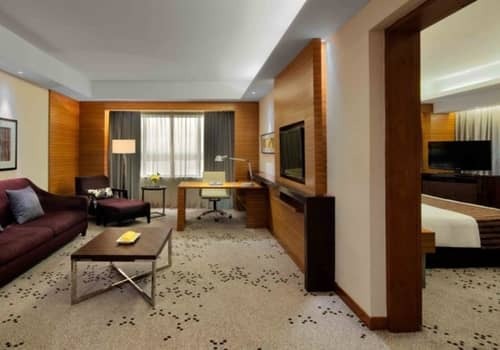 Tripadvisor shows 3430 reviews with an average rating of 4.5, placing the Radisson Blu as the top ranked hotel in Cebu. only 2% of the guests rated their experience there as "below average". Most praise goes for the rooms and breakfast, as well as the quality of service from staff members and the overall beautiful design. The business lounge also gets a lot of love from guests. While complaints are rare, we did see people who found the waiting time for check in/out too long. Over at booking.com, we found 1110 reviews with an astounding rating of 8.8. again, reviews are overwhelmingly positive, praising the breakfast, comfort of the rooms and how clean the hotel is. Some complaints we found mention the front desk staff didn't smile enough, and the fact that the spa is always fully booked. There was also some people complaining the rooms were outdated and furniture too old. 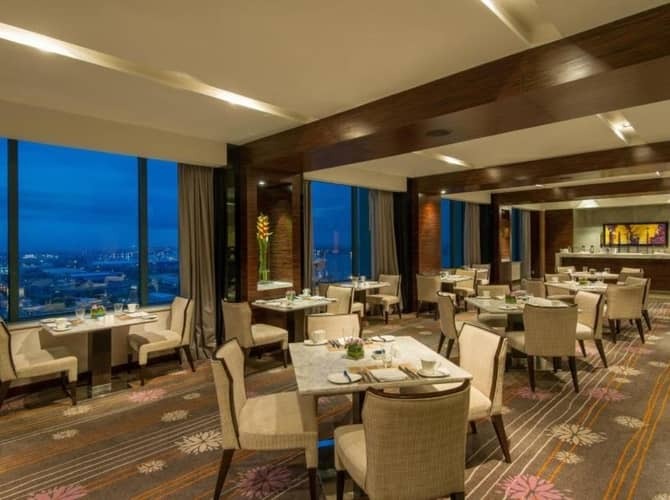 Agoda.com has 3744 reviews, with an average score of 8.9, again making the Radisson Blu the best hotel in Cebu. Some people did complain about the age of the facilities, especially the pool area but also the gym and spa. Another complaint we found was that the surronding area isn't so nice. That is true, since apart from the SM mall the nearby area is mostly industrial. There are 3 different restaurants you can choose from. Feria is the main one, where breakfast is also served and it can host up to 240 guests simultaneously. Lunch and dinner here are also a buffet, but a la carte orders are also possible. Sushisake is a small sushi bar, where fresh servings are prepared right in front of you. It’s pricey, but very tasty. Lastly, there’s the Urban Table restaurant outside by the pool. This is a gourmet chef restaurant specializing in Local cuisine – it’s a fantastic experience but prices are very high. 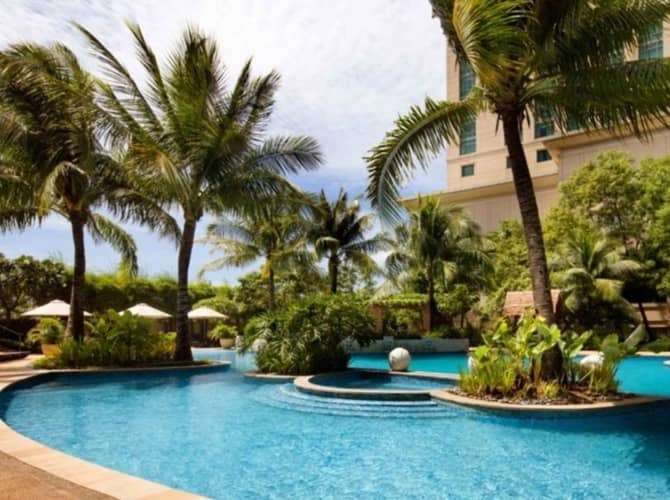 There are also 3 bars you can try out when staying at the Radisson Blu, the Lobby Bar, Pool Bar and Dilmah T-Bar. The lobby bar is open until 1am, while the other two close down at 11pm. 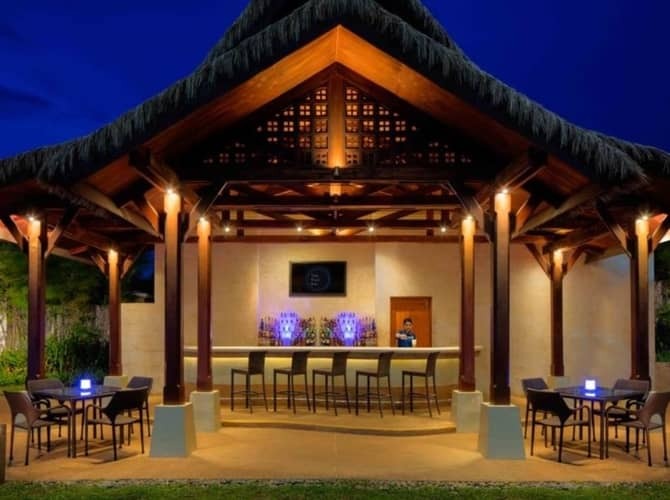 The lobby and pool bar are both quite standard, and prices are actually very fair if you want to enjoy a beer or a glass of whiskey for example. 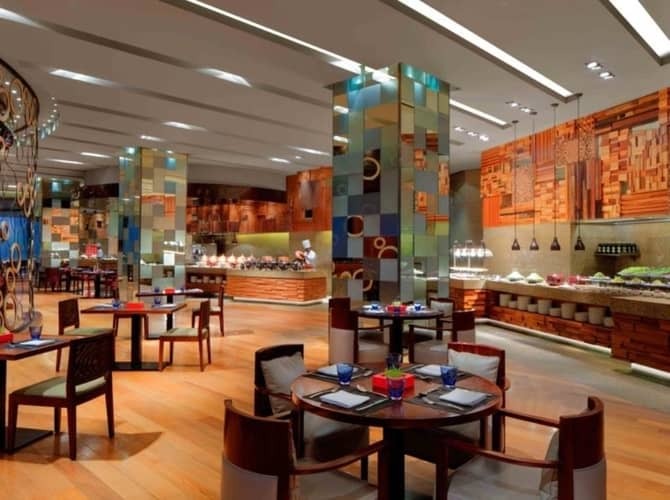 The Dilmah bar is quite interesting, as it offers 23 types of specialty teas from all over the world. The spa and gym are both located at the ground floor. We didn’t get a chance to test it out ourselves, but as mentioned booking an appointment can be difficult. You might want to do so ahead of time. The prices are quite high for the various treatments, but that’s usually the case in 5 star hotels. Still, it’s a bit peculiar they don’t allow for in-room treatments. The Radisson Blu also offers an express laundry service which is in done in-house. This means your laundry can be ready within 3 hours. For people who are only passing through Cebu for a day before heading to another island, this can be a real lifesaver. Room service is also available 24/7, and generally speaking they are very open minded about special requests from guests. 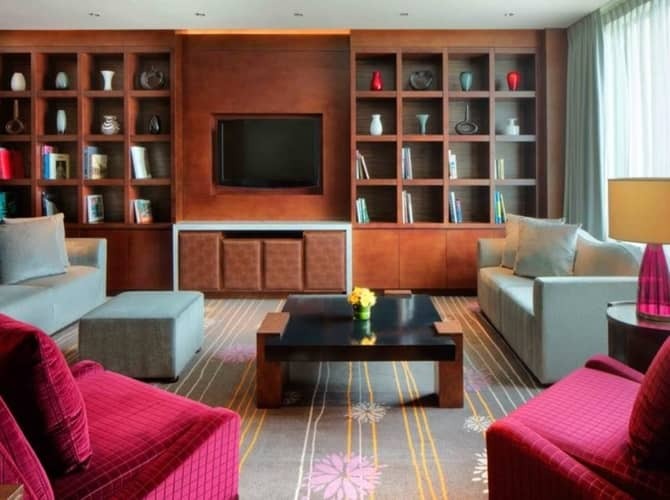 When it comes to the business lounge, there are a few perks you might want to take into account. First, it’s always nice to have your breakfast there. Even though the selection is much more limited than the one at the main restaurant, it’s much more quiet and private. Secondly, you’ll be able to do both your check in and out over there – which will save you a considerable amount of time. 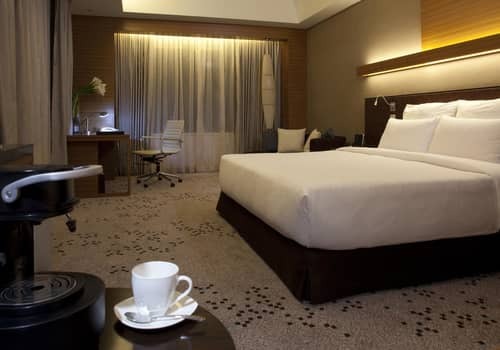 To summarize, the Radisson Blu is a fantastic option for people who only have a night or 2 to spend in Cebu city. For a very reasonable price, you are guaranteed a world class experience. While this hotel might not be the most romantic or family oriented, it does an excellent job of defining its exact clientele and catering to every single one of their needs. These two room types are basically the same, only one allows access to the business lounge. 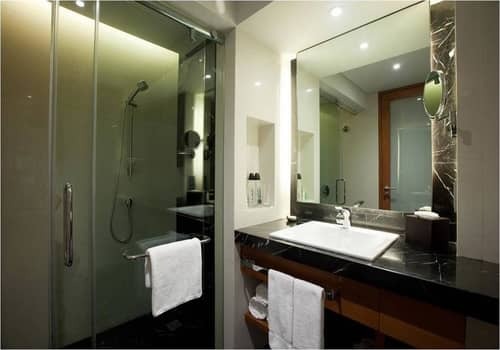 Both are 35 sqm large, with a separate shower area and are fully stocked with a mini bar and all toiletries. there’s also a 37 inch LED TV right in front of your bed. 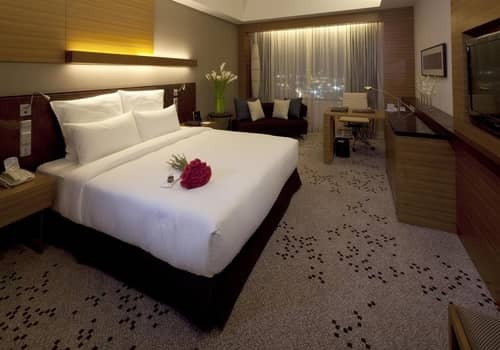 The rooms can be booked with a either a queen size bed or 2 single beds. 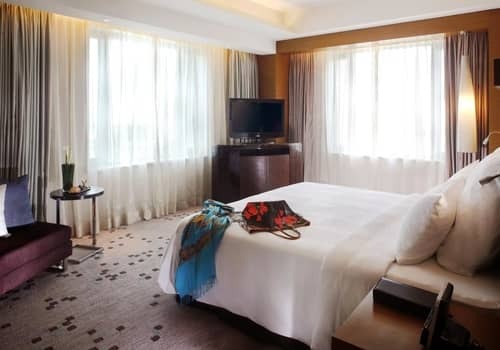 The Deluxe room is a spacious 61 sqm room with a queen size bed and 37 inch LED TV. There’s also a iPod docking station and a working desk. 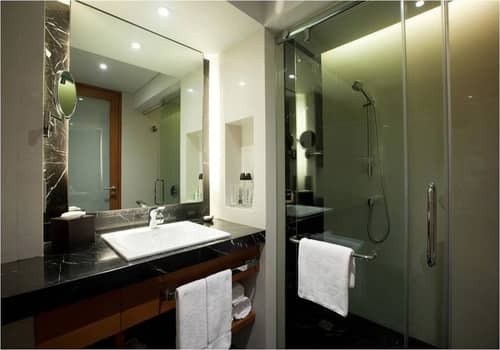 The shower is large and fully stocked with free toiletries, and excellent free WiFi is also available. 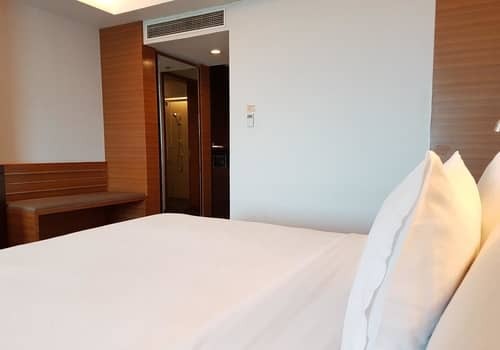 This room is the business version of the Deluxe unit, and at 73 sqm it’s also slightly large in size. The only difference between the Premier and the Executive Suite is the coffee machine. There’s also a receiving area with a large sofa and a 37 inch LED TV, as well as a spacious working station. 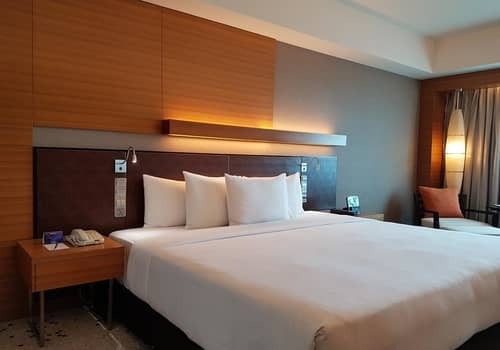 This 73 sqm room comes with all amenities you can think of, as well as a Nespresso coffee machine and a spacious living room area with a sofa and a large TV. there’s also a working desk of course, as well as access to the business lounge upstairs.